The classic peppermint flavor of the candy cane has been around for 600 years, but the original candy canes were just straight sticks, like a real walking cane. In 1640, a German choirmaster decided to change things up by curving the shape to look more like a shepherd’s staff, resulting in the candy cane shape we all know and love today. Around the same time candy canes seem to have gotten their many other food items (like cookies, fruits, candies, and other such things) started to be used to decorate Christmas trees in Germany, where the Christmas trees tradition started. It’s possible the crook shape was chosen simply because it was easier to hang them that way. Since candy canes were made by hand, they were sold out of local candy shoppes. It wasn’t until the 1950s a Catholic priest named Gregory Keller invented a machine that could make candy canes with the curve automatically. Even though the red and white stripes is quintessentially tied to peppermint candies, candy canes did not get their iconic stripes until 1900! Before that they were just plain white. No one is quite sure why the red stripe was initially added in, some say it was candy maker Bob McCormack in the 1920s, but you won’t catch anyone here complaining! The candy cane was first introduced to America in 1847 by a German-Swedish immigrant named August Imgard. The US even has a National Candy Cane day on December 26, so don’t eat them all on Christmas! Each year about 1.76 billion candy canes are made and 90% of candy canes are sold between Thanksgiving and Christmas. 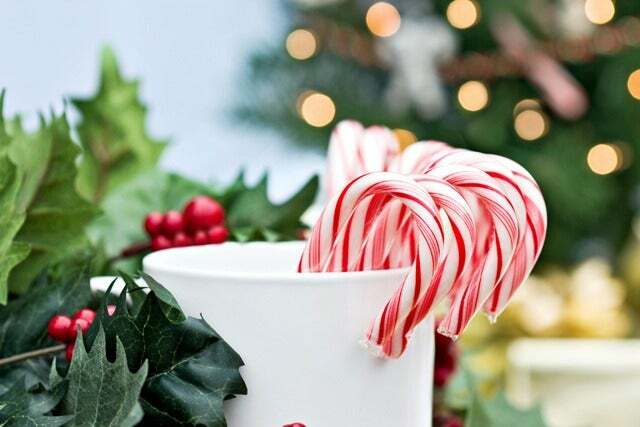 In fact, candy canes are the number one selling non-chocolate candy in the month of December. The biggest single week for candy cane sales is the second week in December; my guess is people stock up on them before Christmas to decorate their tree, bring to parties, and pack as snacks. Since each candy cane has only 55 calories and no fat it’s actually a fairly “safe” holiday treat! Geneva pastry chef Alain Roby broke his third Guinness World Record by creating the world’s longest candy cane in 2012, measuring at 51 feet long. The previous record was 38 feet. Roby also holds world records for the tallest cooked sugar building and tallest chocolate sculpture. Did you know? Our Christmas Stocking Gift and our Season’s Greetings Holiday Snack Gift both include a Hammond’s candy cane! Previous Previous post: 6 Stocking Stuffer Ideas for Grownups! Next Next post: Popcorn on the Christmas Tree?